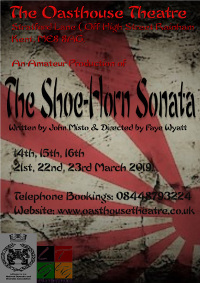 John Misto's The Shoe-Horn Sonata is a powerful, award-winning play based on the true events of two women who survived three and a half years in a Japanese prisoner of war camp in the jungles of Sumatra during World War II. In 1942, a group of sixty-five Australian Army Nurses were evacuated from Malaya. When Singapore fell to the Japanese, the nurses' ship was bombed and sunk. Of the fifty-three survivors, twenty one were murdered and thirty two were taken prisoner. Fifty years later, Sheila and Bridie are reunited to recall their experiences for a TV documentary. What they expect in coming together after many years apart is to relive their memories; the hardships, horrors and tenuous achievements, as well as the humour and daring that was necessary to their survival. What they did not expect was to uncover a devastating secret that both divided and haunted them for half a century.